Mary chose to paint the lighthouse in fog, with waves of the sea, crashing on the rocks, and the light burning in the lighthouse, because God sees everything and warns us like the lighthouse, of the danger that lies ahead of us that we canÕt see. The fog in the painting represents the desires of this world, the lust of the flesh, the lust of the eyes, and the pride of life, that cloud our true vision that God has for us. He gave us His word to help us see through the danger, but if we donÕt spend time in it, how will we see? For some, time is about to come to a close, when the crashing waves of the sea of life will come down upon them.
" If we are living in the light as God is in the light, then we have fellowship with each other, and the blood of Jesus, His Son, cleanses us from all sin." "Wait on the Lord: be of good courage, and He shall strengthen your heart: wait, I say, on the Lord." This painting was created from an old black and white photo of a barge going down the river. The horses were out to pull the barge, which carried merchandise to the people living in the area. 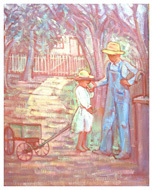 Mary chose to use a palette of light warm to cool colors to share the beauty of a time from the past. "Therefore if anyone is in Christ, he is a new Creation; old things have passed away; Behold all things have become new." "For God so loved the world that He gave His only begotten Son that whosoever believes in Him should not perish but have everlasting life. For God did not send His Son into the world to condemn the world, but that the world through Him might be saved. "He who believes in Him is not condemned; but he who does not believe in Him is condemned already, because he has not believed in the name of the only begotten Son of God. "And this is the condemnation, that the light has come into the world, and men loved darkness rather than light, because their deeds were evil. For everyone practicing evil hates the light and does not come to the light, lest his deeds should be exposed. But he who does the truth comes to the light, that his deeds may be clearly seen, that they have been done in God." 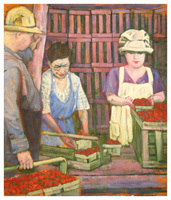 This painting was inspired from an old photograph and painted on a canvas toned in a ray of colors, which she then sketched, designed and painted the people, boxes and strawberries with the love of color. One can imagine a story in this painting between the people in a time in the past. This is a painting/collage. Mary selected verses from God's Word and placed them on the board and then began painting. She wanted them able to be read so was careful in painting the light and shadow not to lose them. She painted the light coming in a prison cell to represent the Light of the World, Jesus, who said "nothing can separate us from the love of God which is in Christ Jesus our Lord." Romans 8: 28 "The Light has come into the world to set the captives free." The shadow of prison bars to represent the prisons we are held in as a result of sin, the key represents the way to freedom from sin, which is found in one way and that way is through the Son of God, Jesus Christ. When God sets us free He gives us a new life, clean and forgiven. Through our Savior, who bought us with His redeeming blood, we have eternal life with God and can know real peace, joy, love, kindness, goodness, faithfulness, gentleness, longsuffering, self-control because we're not alone. 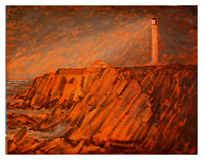 The Lighthouse in this painting is the focal point and the light shining out in the darkness is the story in this painting. 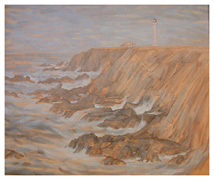 Using brushstrokes Mary gives just the right amount of information needed to show the danger of the rocks and a palette of limited to mixture of dark colors to draw one's attention from the lighthouse to the ocean and the rocks. Mary thinks of the light as God's light exposing the dangers that are in the paths of our lives. His light never goes out and when we are sinking in sin and ask God for help, we find He has already sent the lifeboat needed through the price paid on the cross, through Jesus Christ our Lord. "Behold, the Lord's hand is not shortened, that it cannot save; neither His ear heavy, that it cannot hear:"
"If we say we have fellowship with Him, and walk in darkness, we lie and do not practice the truth. But if we walk in the light as He is in the light, we have fellowship with one another, and the blood of Jesus Christ His Son cleanses us from all sin." "I am the light of the world. He who follows me shall not walk in darkness, but have the light of life." 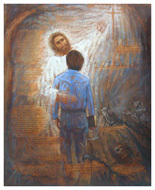 "And you He made alive, who were dead in trespasses and sins, in which you once walked according to the course of this world, according to the prince of the power of the air, the spirit who now works in the sons of disobedience, among whom we all once conducted ourselves in the lust of our flesh, fulfilling the desires of the flesh and of the mind, and were by nature children of wrath, just as the others." This painting was created with a palette knife, oil paint and a colored mat board. Mary's love for the Lord, His Word and the youth is seen here. This painting was done as a sketch for a future painting to be painted someday. This allowed her to have more freedom in the colors and painting freely from the heart. Her desire was to share how precious the time is with the Lord. She placed the Lord behind the teenager with his finger pointing in the Bible that the boy is reading, to illustrate how God speaks to us through His Word (Bible) as we seek to know Him and His will for our lives. 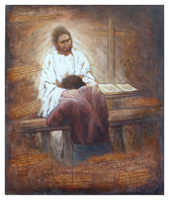 "My son, attend to my words; incline your ear unto my sayings. Let them not depart from your heart. For they are life unto those that find them, and health to all their flesh." "	I will instruct thee and teach thee in the way which thou shall go: l will guide thee with mine eye." "Ask, and it shall be given you; seek, and ye shall find; knock, and it shall be opened unto you: For every one that asks receives; and he that seeks finds, and to him that knocks it shall be opened." 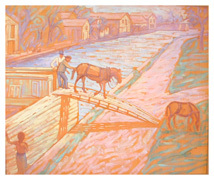 Water for the Thirsty, this painting was painted on purple toned canvas, and spring colors were chosen to set the mood. Be a good neighbor look for opportunities to show love to those around us. "Be doers of the word, and not hearers only deceiving yourselves." Mary painted this one with the scripture in it. 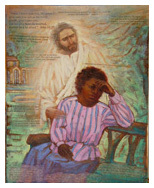 Also she decided to change the woman sitting on the bench with the colors and strokes different, but the story is the same as it is in "The Comforter" shown in Inspirational art. God's word never changes. His promises are the same today as the were in the beginning. God is faithful. "He heals the broken in heart, and binds up their wounds." "Peace, I leave with you, My peace I give unto you: not as the world giveth, give I unto you. Let not your heart be troubled, neither let it be afraid." 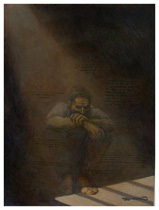 Mary painted this illustration on abuse to illustrate what is hidden from the outside behind closed doors. 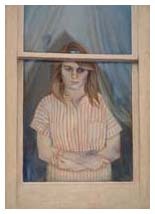 She placed the woman standing at the window looking outside to express the pain in seeing the visions of dreams and hopes she once had for the future gone, replaced by fear, brokenness and abuse. She had her clinching her arms to express the desire to be helped, but lack of trust and faith in people keep her chained in fear but there is help, hope and peace. God cares about you. Mary wanted this illustration to encourage people to reach out to their neighbors with real love and care. They could be the instrument that God has chosen to change the situation, to help,encourage and speak truth in love. "Let nothing be done through selfish ambition or conceit, but in lowliness of mind let each esteem others better than himself. Let each of you look out not only for his own interests, but also for the interests of others." "Ask, and it shall be given; seek, and ye shall find; knock, and it shall be opened unto you: For every one that asketh receiveth; and he that seeketh findeth; and to him that knocketh it shall be opened." 11 Peter 1:21 "For the prophecy came not in old time by the will of man: but holy men of God spake as they were moved by the Holy Ghost." 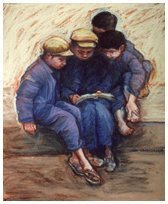 I was inspired from what I saw in part of an old photograph of children in class. I was attracted to what the children were doing some seemed to be paying more attention to those around them then doing class work while others were oblivious to those around as they were intent in their work. I also found their clothing, the girls with their hair in curls secured with ribbons, the desks and so on... very interesting. I chose to use green for the desk because I liked the way it looked in the painting and since a lot of my painting is not in traditional colors but on how I feel. I wanted to use the strokes of paint to move one up in the painting. The mountain in the background is Mount Shasta the train was an old steam engine. I even wanted the steam from the engine to move around and up as faded away. It was a challenge as I didn’t want to lose the movement of the train yet I wanted to include some of the detail of the train. The same was true about the colors I chose as part of me wanted to be free to use colors other than traditional realistic colors so I could set the mood. This is more than a portrait, more than an original painting, more than an illustration. It’s an heirloom that tells a story, keeps a memory alive and is to passed down from one generation to another. We all have those special pictures that have memories they are kept in albums and are brought out every once in a while. We also have paintings that are pretty and look nice with the furniture. Mary’s desire is to paint memories that tell a story that are part of our lives, more than pretty pictures. Instead of being in an album they are shared, seen and enjoyed by many people. “You are the light of the world. A city that is set on a hill cannot be hidden. Nor do they light a lamp and put it under a basket, but on a lamp stand, and it gives light to all who are in the house.” Matthew 5:14,15 Mary’s desire was to illustrate the hunger for the truth in the children’s faces. It is so easy to ignore the needs both spiritual and physical of those outside our homes. Jesus commanded us to love one another, the question is how much do we love others. This painting was created from an old black and white photograph. Mary had a lot fun with bringing this scene to life using color to tell the story that she was seeing. Like so many of her paintings she toned the canvas first and when she began to paint, she would allow the toned canvas to be seen, complimenting the colors being used in this painting. 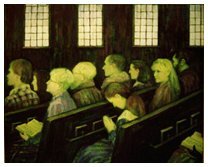 Mary toned the canvas with a warm earth color and allowed a lot of the canvas to be seen, using complimentary colors painted in bold strokes to bring this story to life. An outing at the park is a memory stored in the minds of all that are present. Little treasures were more than gold, that are shared for years from the old to the young. "Behold I stand at the door and knock. If anyone hears My voice and opens the door, I will come in to him and dine with him, and he with Me." She also has painted another woman looking over at her with a smile on her face signifying the joy that is felt when we see God at work in a responding heart. 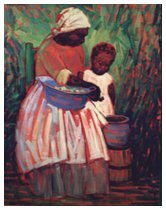 In this painting the canvas was toned with orange and the people, clothing, and background were changed from the black and white black and white photo which inspired Mary to paint this scene, where families were close and children learned from watching, listening and helping. There was a bond that was made in families and among the neighbors. A genuine caring for each other, real love in the flesh not just in words or bought with money, but with time well spent. "Train up a child in the way he should: and when he is old, he will not depart from it." As Mary completes additional pieces of art, she will add them to this page and later transfer them to their appropriate locations. Many of her paintings are created in art prints and cards. If you would like to request other types of work please contact Mary.